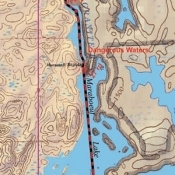 This map details the last 4 miles of the Gunflint Trail, Saganaga, Saganagons Lakes and Cache Bay. 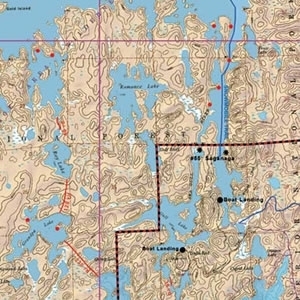 Including BWCA canoe entry points 54, 54a, 55, and 55a. BWCA motor entry points J and K. Quetico Park canoe entry points 73, 74, 75(#75 is fly-in only) and the Cache Bay Ranger Station.